Welcome to our First Aid certification class! In emergencies rescuers need to act quickly and effectively because in many situations getting proper first aid means the difference between life and death for the patient. 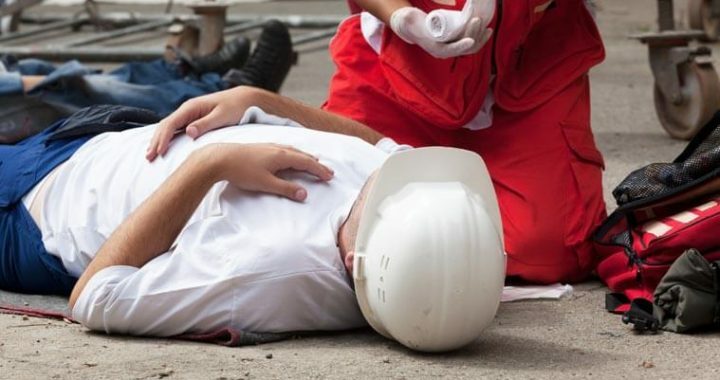 Knowing how to perform first aid correctly could easily mean that rescuers can end up saving someone’s life or minimizing catastrophic injuries, making a difference in the recovery from trauma and the future life of the victim. There are many types of injuries that require first aid, and they range from non-serious (such as nosebleeds) to moderately severe (such as cuts and scrapes), to life-threatening (such as burns and loss of blood) or other injuries and conditions resulting from the injury. Proper first aid begins with proper training in the correct application the techniques and being prepared with an adequate supply of first aid supplies. First aid supplies should be present in all locations where people have activities or interact socially, or the workplace, schools, institutions, and in automobiles. 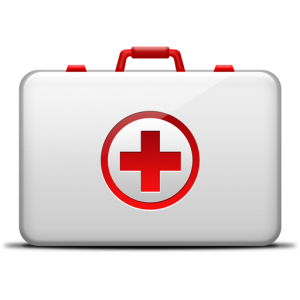 An adequate first aid kit should contain the following items to properly prepare for most types of emergencies victims may find themselves in. The Good Samaritan Law protects those who assist with those injured, ill, or in peril. If the Good Samaritan takes action without expectation of reimbursement legal protection will be applied. Remember the Goal: the goal of first aid is to provide immediate assistance and to get emergency assistance as soon as humanly possible in order to treat a victim and prevent death or other potential injuries such as brain damage from occurring. – Introduction Note: First Aid Certification Class. It is imperative for rescuers to be fully prepared and to have an emergency response plan in place and to quickly activate it to reach EMS personnel through the Emergency Medical Services (EMS) system. One more step that should be in place is having a plan in place to be able to quickly reach the Poison Control Center (1-800-222-1222). The chances for the survival of a victim/patient increases dramatically the faster that emergency assistance can be reached and provided. If rescuer(s) are in danger, secure the area or move the patient to a safe area as soon as possible, if possible, and activate EMS without any unnecessary delays. Open chest wounds may remain open while being treated with first aid. You may apply direct pressure to the wound to stop bleeding. Dressing the wound with a wrap or sterile pads may be required, and you may do so as needed. 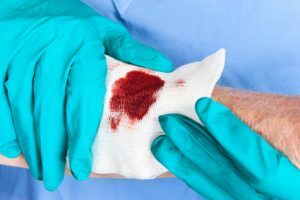 Keep in mind that dressings may become occlusive if they are left to saturate with blood, so all dressings must be attended to and extreme care must be taken so they are not left to accumulate too much blood. Change dressings frequently and modify the procedure as required by necessity. It is very important to avoid dressing open chest wounds if it can be avoided, however, as the danger of a life-threatening condition known as tension pneumothorax may develop inadvertently. Other risks when treating an open chest wound are not as great as the potential of this grave condition, so if it is at all possible do not use dressings. Dressing Open Chest Wounds: when you find it is unavoidable and an open chest wound must receive dressing, first activate the Emergency Medical Services (EMS) or call a 911 center immediately. Evaluate patient to determine if there is more than one open wound in the chest area, and if so, how many open chest wounds will require dressing. The dressing should only be applied in the event of rapid blood loss. Remove the patient’s clothing, with the exception of any stuck clothing. Cut, size, and shape the dressing while making certain dressing is larger in dimension than the wound itself. Never at any time attempt to remove objects from the wound area, leave this for emergency personnel. Punctured Wounds: this type of wound can be extremely severe, and if infected they pose a serious risk to health. If there is excessive bleeding from the wound, activate Emergency Medical Services (EMS) or contact a 911 center immediately. Evaluate the patient and if at any point in time the patient becomes unconscious or unresponsive or a pulse cannot be detected, begin CPR immediately and contact emergency personnel as previously instructed. Note: To reduce the risk of infection and to speed the healing process make sure to apply the appropriate wound steps. Remember, a wound is any damage or break in the skin’s surface. – Types of Wounds Note: First Aid Certification Class. 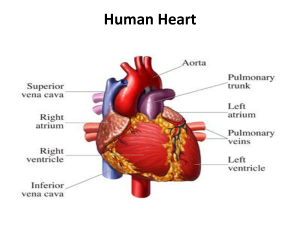 Cardiopulmonary Arrest: Cardiopulmonary arrest, otherwise known as cardiac arrest or a heart attack, occurs when the heart stops beating and the flow of oxygenated blood ceases in the body of the affected patient. 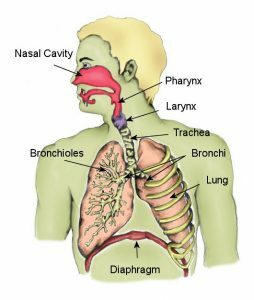 In many cases, the lack of the flow of oxygenated body throughout the body will result in the victim becoming unconscious or unresponsive. If left untreated, the most likely result will be death or probable brain damage in most cases. Victims should always receive treatment as soon as possible and never left untreated. A Heart Attack: when the patient’s heart has stopped beating, the heart no longer receives oxygenated blood and begins the process of death. Symptoms of a heart attack include: sharp pain in the center of the chest area accompanied by profuse sweating, nausea or vomiting, and fainting or dizziness or lightheadedness. Other pain throughout the body is also known to occur such as pain in the jaws, teeth or arms, neck, and shoulder areas. Treatment: If a patient shows the symptoms of a heart attack and they are lifeless or not responding, begin the C, A, B techniques immediately, administer aspirin (check patient for allergies to aspirin if information is available) and quickly rush the patient to the nearest available hospital or activate EMS or call 911 for emergency assistance immediately. Do not wait for symptoms to “go away” and do not leave patient untreated. Begin CPR as soon as possible when discovering the patient condition or emergency situation. Chest Pain: if a patient is experiencing the symptoms of a heart attack, then additional steps may be taken to ensure the well-being of the patient. If the signs of myocardial infarction are present in a patient, chewing an aspirin or two low dose aspirins may be recommended if the patient reports they have no existing allergies to aspirin. If a provider is unsure of whether aspirin allergies exist, the patient can be referred to Emergency Medical Services (EMS) personnel for additional emergency treatment. Respiratory Arrest: when the lungs fail to function, the flow of oxygenated blood through the body will result. This condition must be treated immediately, otherwise, the most likely result for the patient will be death. Loss of oxygen to the brain will cause unconsciousness, and in many cases, brain damage will also occur if left untreated. Measures can be taken to administer artificial ventilation, which is critical to saving the life of a patient who is experiencing respiratory arrest. Note: If a patient experiences respiratory arrest, they should be treated with CPR immediately, or as soon as possible. Emergency Medical Services (EMS) should be activated or emergency services requested by calling 911 and the patient should be rushed to and treated at a hospital. – Respiratory Arrest Note: First Aid Certification Class. Fracture: Fractures are very serious and can cause death or paralysis or deformity of limbs if not treated properly. It’s critical to understand what fractures are and how to evaluate their severity and know when it is appropriate to administer CPR techniques as a measure to treat those with injuries that include fractures. Note: Check the patient thoroughly, and if there are signs of broken bones in the head, neck, or back, heavy bleeding, deformity of the joints, irregularly fixed bones, broken bones piercing through the skin, or other abnormalities accompanied with the lack of a pulse, then begin CPR techniques immediately and alert Emergency Medical Services or contact a 911 center directly and request emergency assistance. – Avulsions, Bruises, Fractures, Sprains & Strains Note: First Aid Certification Class. Treatment: If the fractured area is bleeding, apply pressure to the area to stop the bleeding and wrap fracture if it becomes necessary to do so. If possible, apply a cold pack or ice pack to the affected fracture area to reduce swelling. If the patient is seriously injured and cannot move by themselves, do not attempt to move the patient. Contact Emergency Medical Services (EMS) or contact a 911 center as soon as possible. Remember: In the event that a patient is feeling dizzy or lightheaded or has fainted or lost consciousness, take steps to elevate patient by placing legs at a slightly higher level than their heart in order to raise their blood pressure. Dental Avulsion: In the event a tooth or teeth have been removed from a patient through injury, these teeth may be able to be implanted again successfully in the patient. In order for teeth to be implanted again, they must have viable dental cells for this procedure to be successful. To keep a tooth or teeth viable for re-implanting, the tooth or teeth must be stored in an appropriate solution until they can be rushed to a hospital to attempt re-implanting of the tooth or teeth. A solution that is shown to have a high efficacy for this need is Hank’s Balanced Salt Solution. This solution will provide cell viability for 30-120 minutes. If a tooth or teeth have suffered avulsion, it is critical that if they are to be saved, the patient must seek medical help immediately to prevent the suffering of tooth loss. Bruises: Bruises are marked by the appearance of dark spots under the skin caused by broken blood vessels that have leaked and collected in patches, caused by falling, being struck, etc. Treatment: Bruises will heal over sufficient time and are usually not serious. Pain can be somewhat alleviated in the patient by elevation of the affected area. The application of cold or ice packs or cold cloths will also reduce discomfort and decrease swelling. If necessary, the patient can also reduce pain and discomfort by taking Acetaminophen or Aspirin. If the bruise is located on the head or face area or lasts for a time longer than 14 days, a visit to a hospital may be advised. Sprains and Strains: The main difference in sprains and strains are where they occur in the body, although they are quite similar. Sprains are injuries located in parts of the body with ligaments, such as wrists or ankles. The locations of strains may in the leg, such as a hamstring or thigh. Treatment: In the event of a sprain or strain, elevate the affected area 12 inches above the heart. Apply a brace if possible or apply a bandage to the affected limb or joint to support the body. If using a cold pack, ice pack/compress or cold cloth only apply to the affected area for 20-minute time intervals. In the event that a patient becomes irritated, shorten the length of time that cold is applied to 10 minutes at a time. Burns are very serious, painful and can be life-threatening. There are three standard categories of burns; 1st degree burns, 2cnd degree burns, and 3rd-degree burns. There are specific procedures for treating the different burn degree types. Each degree of burn is based on layers of skin that have been breached by the burn. Symptoms of a 1st-degree burn includes acute redness, swelling of the burn area, and persistent pain uncomfortable enough to cause significant distress. Only the first layer of skin is affected by this type of burn. Symptoms of a 2cnd degree burn include severe pain, swelling in the affected area usually accompanied with blistering. The term second-degree burn refers to the burn itself breaching the second layer of skin. Treatment: Burns can be very serious if not treated properly. If a burn is large and spans an area larger than 3 inches in diameter, then it is serious enough to require immediate treatment by medical personnel and a visit to a nearby hospital is advised. If the burn is smaller and spans an area smaller than 3 inches in diameter, then treat the burn much the same way you would treat a 1st-degree burn. This is the most serious type of burn and can be life-threatening in some cases if left untreated or treated improperly. This type of burn breaches the 3rd layer of skin but in some cases, it may go deeper and include charring of the flesh. Immediate medical assistance is required and rescuers should activate Emergency Medical Services (EMS) and contact their 911 center without delay and rush the patient to a nearby hospital for medical treatment. In some cases, the charring of the flesh will deaden the nerve endings of the patient and they will not feel a high amount of pain. Note: A rescuer should never introduce any frozen material, solid or liquid, to the surface skin area of a burn. Placing frozen material on the skin of a burn can cause a condition known as tissue ischemia. Applying cold water on the affected burn area for at least 10 minutes is advised instead. If there is no cold water available, then a clean cool compress can be substituted. – Burn Types Note: First Aid Certification Class. Electroshocks are not known to cause any harm, mild or severe. 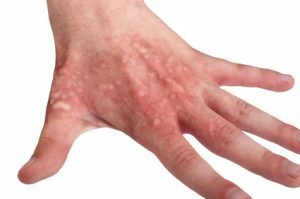 Most bites and stings commonly experienced are not extremely serious, however, there are some types that have serious, even life-threatening consequences if left untreated. The majority of stings do not result in fatalities, yet there are certain insects that are carriers of deadly diseases such as Lyme disease, the Zika virus, or the West Nile virus. Severe reactions to stings include a condition known as anaphylaxis. Symptoms of this condition include abdominal pain, difficulty breathing, a lowering of blood pressure, redness, swelling, or vomiting and nausea. Mild Reactions: Mild allergic reactions usually take the form of swelling of the area around sting, diarrhea, cramps, vomiting, and nausea. When treating mild reactions to a sting, treat with universal precautions, gently remove the stinger from the patient, and apply a cold pack or cold cloth to the area. Administer a pain reliever such as Advil, Aspirin, or Acetaminophen to the patient, as well as Benedryl or another form of antihistamine if necessary. Severe Reactions: Symptoms of a severe, and the potentially dangerous reaction may include labored or difficulty breathing, swelling of the lips and throat, fainting or dizziness, hives, vomiting, and nausea. Treatment: Position the patient on their side if needed and administer an auto-injection into the thigh or buttocks area and massage injection for a more rapid response. If the reaction is severe, administer CPR immediately. Those who experience a drug overdose have ingested far above the prescribed or recommended amount of a drug and may suffer from a range of symptoms and if left untreated this may result in death. 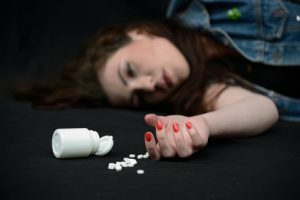 There are a wide number of potential reactions to a drug overdose, including unconsciousness or drowsiness, hallucinations, an excitement paired with a rapid heartbeat, and impaired decision-making skills or judgment. Other symptoms of a drug overdose may include difficulty breathing, unconsciousness. Delusional behavior or aggressive violent behavior, convulsions, sweating, numbness, vomiting or nausea, abnormal pupil size or non-responsive pupils. Treatment: Use all universal precautions and evaluate the patient. If the patient is unconscious, unresponsive, or has no pulse, begin CPR at once and activate Emergency Medical Services (EMS) and call a 911 center immediately. If possible reassure patient of their safety and try to keep them calm. Evaluate patient for symptoms of shock and treat accordingly while monitoring vital signs. Document any and all of the drugs taken both as overdose and otherwise and report to emergency personnel. Note: A drug overdose describes the application or ingestion of a drug or other substance in quantities greater than are recommended or generally practiced. An overdose may result in a toxic state or death by suicide. – Drug Overdose Note: First Aid Certification Class. Poisoning can be fatal in many cases and should be taken extremely seriously and not left untreated. If you suspect or know a patient has been poisoned, contact the National Capital Poison Center by phone at 1-800-222-1222. Symptoms of poisoning include any of the following: difficulty breathing, vomiting or nausea, confusion, sleepiness or drowsiness, chemical odors exuding from the mouth area, burns (redness) around the mouth area, burns on skin or clothing. When treating the ingestions of poison, never administer anything by mouth unless specifically directed to do so by PCC or EMS personnel. Treatment: If the patient is not breathing or is unconscious, administer CPR immediately and activate Emergency Medical Services (EMS) or contact a 911 center immediately. Wash and rinse out the patient’s mouth and take them outside into fresh air if possible. Read the labels of the chemicals that have been ingested and follow the directions on the label for accidental poisoning. Flush out the eye areas of the patient and wash and clean the skin of affected areas. Keep the chemical container or the label of the chemical ingested and give to EMS personnel when they arrive on the scene. A significant loss of blood in a patient’s body is known as a hemorrhage. Hemorrhages are classified into four different types, based on the amount of blood the patient has lost in one period of time. This class of hemorrhage includes up to 15 percent blood loss volume. Typically, there are no changes to the vital signs of the patient. The second class of blood loss ranges from a loss of 15 percent to 30 percent of the patients total blood volume in one period of time. 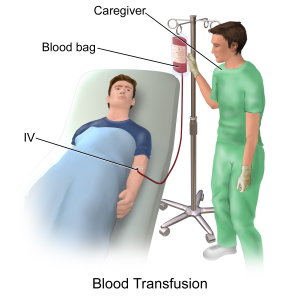 In these cases, blood transfusions are not typically necessary, however, the use of a saline (salt water) solution may be needed. The loss of this amount of blood is usually accompanied by a rapid heart-beat. This class of hemorrhage is marked by a 30 percent to 40 percent loss of blood volume and is quite severe. Steps must be taken to treat the patient, as it will become necessary to perform blood transfusions to save the life of the patient. Symptoms displayed by the patient usually include a rapid heart-beat along with a sudden drop in blood pressure. When a patient has lost 40 percent or more of their total blood volume. Resuscitation must be performed in order to prevent death from occurring. Treatment: Evaluate patient using all universal precautions. If necessary, initiate CPR and activate Emergency Medical Services (EMS) or call a 911 center immediately or bring the patient the nearest hospital as quickly as possible. If needed, wrap the hemorrhage to prevent further loss of blood. Note: If bleeding is severe, call an EMT (Ambulance) immediately. You should seek emergency help if you suspect internal bleeding. This can become life-threatening. – Hemorrhages Note: First Aid Certification Class. Hypoglycemia is a bodily syndrome that is caused by low blood sugar. For diabetics, hypoglycemia can be life-threatening if not treated. Never leave a patient who appears to be experiencing hypoglycemia untreated. Symptoms: The symptoms of hypoglycemia range in severity. Varying from person to patient, at the onset of this syndrome a patient may experience shakiness, sweating, hunger, anxiety, fatigue, irritability, pale skin, heart palpitations, and a tingling sensation around the mouth areas. This syndrome can increase in severity and symptoms may become much worse. Severe symptoms of hypoglycemia include a confused state of mind, seizures, abnormal behavior, blurry vision, inability to perform ordinary routine tasks and unconsciousness. This syndrome must not be left untreated. Treatment: In most cases, the occurrence of symptomatic hypoglycemia can be treated with oral glucose tablets. If no oral glucose tablets are available, the substitution of liquids such as juice and foods containing sugars such as sucrose, fructose, oligonucleotides are acceptable and will effectively combat and reverse the effects of hypoglycemia. Oral glucose tablets and liquids or foods containing these sugars will rapidly absorb into the bloodstream and counteract hypoglycemia quickly. In many cases nosebleeds are a common occurrence and are not a serious medical issue requiring emergency services, CPR, or hospitalization. However, in some cases, they may be much more serious and require emergency resuscitation treatment. Treatment: In the event a nosebleed is a result of a much more serious trauma to the body such as a head injury or broken nose, you will need to take steps to treat the patient. If a patient has a nosebleed from a serious injury and there is profuse bleeding, apply direct pressure to the area for at least 10 full minutes. During this time direct the patient to breathe through their mouth. After the period of applying pressure is finished, take a moment to clear the nasal cavity of the patient. If the patient is suffering from congestion, wash the nasal cavity thoroughly and use a nasal decongestant after directing the patient to blow or clear their nose to assist in clearing the congestion. If the patient lapses into an unconscious or unresponsive state, begin CPR immediately and activate Emergency Medical Services (EMS) or call a 911 center immediately and secure emergency services for the patient. If the patient – if the patient experiences repetitive nosebleeds, it may indicate that there is a much more serious medical condition present. In this case, contact a physician or hospital and have the patient evaluated and treated by medical personnel. Choking occurs when food or other objects become lodged in the windpipe or throat of the patient. In children, many times choking occurs because of the swallowing of small toys or other small objects. Choking should be treated very seriously because it can lead to permanent organ damage or death if left unrecognized and untreated. Note: Many times choking goes unrecognized because the victim is inadvertently mimicking themselves, and those around feel they are merely coughing or expectorating. Be certain the potential victim is actually choking,g and take immediate action if they are indeed choking and not coughing or expectorating. – Choking Note: First Aid Certification Class. If the patient has become unconscious or unresponsive, take emergency measures and contact a 911 center immediately for further treatment. Position the patient face-down on the surface of the forearm, while resting the forearm on the thigh for support. Perform a thumping action 5 times on the back of the infant, using the heel of the hand. In the event choking continues, turn the infant over to a face-up position and prepare to administer chest compressions. Using two fingers placed upon the breastplate, perform 5 chest compressions. Keep repeating this process until object becomes dislodged and choking ceases. In choking patients, the universal emergency treatment is what is known as the Heimlich maneuver. First quickly evaluate the patient and determine if they are indeed choking. Then act quickly to perform the Heimlich maneuver on the patient. The Heimlich maneuver consists of several steps. The first step is to stand directly behind the patient. Position the patient so they are leaning slightly over, then wrap hands and arms around the waist of the patient. Take fist and close it tightly, and then grab fist with another hand. Press the interlocked fists, performing 5 sharp, hard thrusts into the abdomen of the patient. Repeat this cycle until object becomes dislodged from the windpipe of the patient. This maneuver is highly effective and should be used immediately in choking cases. If the patient is unconscious, you will need to take additional steps to perform the Heimlich maneuver effectively. The first step is to position patient so they are lying on their back, face-up, in an area free from obstructions. If necessary, use fingers to swipe the patient’s airway to clear it out before you begin performing the Heimlich maneuver. Perform Heimlich maneuver until object becomes dislodged from windpipe or throat. If you are unable to clear the airway of the patient, or you can’t see or dislodge the object from the throat or windpipe, begin CPR and activate Emergency Medical Services (EMS) or call a 911 center immediately. If the patient is unconscious or is not showing signs of life, begin CPR immediately and get emergency assistance as previously instructed. Dehydration occurs most often when the patient is performing strenuous exercise in humid, hot environmental conditions for extended periods of time. Dehydration is a result of the body losing more fluids than it consumes, and if lost fluids are not regularly replaced, the patient will experience dehydration eventually. In many cases ingestion of ordinary H2O is sufficient to restore the levels of bodily fluids in dehydration victims. Additionally, patients may rehydrate by using carbohydrate-electrolyte (CE) drinks with a solution of 5 percent to 8 percent, or by drinking coconut milk and water drinks. The use of these drinks will restore the electrolyte balance in the patient as well as provide enough H2O for the patient’s body to sufficiently recover from dehydration. In cases of severe dehydration, the condition of the patient may be life-threatening. Steps should be taken to rehydrate the patient and the rescuer should activate Emergency Medical Services (EMS) and call 911 immediately for emergency assistance. The state of hypothermia exists when the patient’s body temperature falls below 95 degrees F. Hypothermia is caused by the body losing heat at a rate more rapid than it can produce energy to form body heat. The most common form of hypothermia is caused by the immersion of the patient’s body in cold, freezing water for extended periods of time. If hypothermia is left untreated, the nervous system will break down, leading to potential organ damage and possibly death in some cases. Remove the hydrated, wet clothing of the patient and provide dry, warm clothing to replace it. Provide a dry, warm environment for the patient to recover their body heat. If available, provide the patient with a warm beverage to raise the body temperature. You may apply dry, warm compresses on the body of the patient, but do not apply direct heat to the skin of the patient. If the patient has lost consciousness or has become unresponsive, apply rescue breaths, and if these are unavailable perform chest compressions. If the patient is not showing signs of life, administer CPR and activate Emergency Medical Services (EMS) and contact a 911 center immediately. There are several main types of injuries, such as eye injuries, concussions, head injuries, and spinal injuries. These injuries range in severity and each of them requires different first aid and emergency steps to treat them. The main types of common eye injuries include the Black Eye, a Chemical Splash in the eye area, and having a Foreign Object lodged in the eye area. 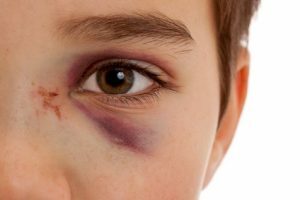 A black eye is a result of an injury to the eye area such as being struck that causes blood vessels to become broken under the skin, or bleeding under the skin, which makes the flesh around the eye bruise and becomes discolored (black). 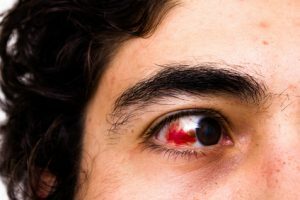 Bleeding within the eye itself is a condition known as Hyphema, where there is blood in the cornea area of the eye or within the front chamber. Most black eye conditions are not overly serious, but they require first aid treatment to minimize the damage the injury has caused. If possible, apply an ice pack or cold compress or cold, wet cloth to the eye area to reduce the swelling of the injury and facilitate the healing process. If the eye shows signs of internal bleeding or if there is blood leakage from the eye, seek emergency assistance from the nearest hospital immediately. Many times foreign objects can be quickly and easily removed from the eye area, but in some cases, this type of injury can be quite severe in nature. Do not leave untreated and be certain this type of injury is treated properly. Before treating, wash hands with soap and water thoroughly so they are completely clean. Pull down the lower lid of the eye, while directing the patient to look in an up and down motion. Wash out the eye area with H2O or a saline solution to dislodge the foreign object(s), and make sure the eye area is clean. If there are any visible abnormalities or serious, persistent pain and rescuer is unable to remove or dislodge the foreign objects from the affected area or objects are embedded in the eye, seek help immediately by contacting a 911 center or rushing patient to the nearest local hospital for treatment. Chemical splashes, depending on the chemical involved can be non-injurious to severe in nature, creating no pain, mild pain, or extreme pain in the victim. If necessary, remove any contact lenses from the patient before treatment. Position the patient’s head beneath running warm or lukewarm water and let the water run over patient’s eyes for a duration of at least 20 minutes. Continue for a longer duration if pain continues to persist. If there is persistent pain or damage is severe, call a 911 center or rush the patient to the nearest hospital for treatment. If possible, bring the chemical container or at least the label for the container with the patient to the hospital and deliver to emergency personnel for a medical determination. Note: The seriousness of ocular injuries does not necessarily correlate with the degree of visual impairment or pain. – Eye Injuries Note: First Aid Certification Class. Examine the patient, evaluate the severity head injury and test for evidence of a concussion as soon as possible, especially if there is a loss of consciousness. Be certain that patient stops the activity they were involved in, such as sporting activities. Direct the patient to rest in a quiet area free from noise and activity, if possible. To reduce swelling and prevent the injury from becoming worse, use ice wrapped in a washcloth and apply gently to the injured area. Administer a pain relief agent such as Advil or Motrin, Aspirin, or Acetaminophen and offer the patient a glass of cold water. If the injury is severe, activate Emergency Medical Services (EMS) and contact a 911 center immediately and rush the patient to the nearest hospital for emergency treatment. 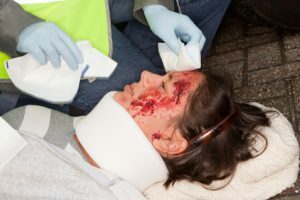 Many times a head injury only amounts to bruises or bumps on the head, but in other cases, these injuries can be quite severe and require emergency treatment. Do not attempt to move the patient and refrain from removing clothing unless it is absolutely necessary. If blood loss is occurring, apply dressing to prevent further blood loss, but do not apply any pressure to any head wounds. If the patient is unconscious or unresponsive or there is no pulse that can be found, begin CPR and activate Emergency Medical Services (EMS) and contact a 911 center for emergency services as soon as possible. Injuries to the spine are extremely serious and dangerous, and great care needs to be taken to treat the patient. If there any kind of suspicion that a patient has suffered a spinal injury, do not move patient for any reason. Reasons to suspect there may be a spinal injury include: severe head injury, severe back pain, lack of bodily control of bowels, bladder, or limbs or numbness of the body. Activate Emergency Medical Services (EMS) and call a 911 center immediately. Do not attempt to take the patient to a hospital yourself, as precautions and special handling must be used to move a patient with a spinal injury. Make sure to prevent the patient from moving or being moved around or disturbed, be certain the patient lies as still as possible. If the patient is unconscious or unresponsive or has no pulse, begin CPR and if the patient has no pulse, begin a minimum of chest compressions. Do not remove any items from the patient’s person. If the patient is experiencing bleeding from the nose or mouth or is vomiting and there are two responders, turn the patient on their side, taking care the patient’s body is following the synchronized movements of both responders. Shock can set in from a variety of causes. When a patient falls into shock, the body may stop the flow of oxygenated blood. Vital organs can be severely affected, and brain damage can result if oxygenated blood does not reach the brain. People can also die from shock or the problems associated with shock. People develop shock for a number of reasons including heat stroke, profuse blood loss, poisoning, severe burns, trauma to the body or extreme medical accidents. Signs that a patient may be suffering from shock include: unconsciousness or poor responsiveness, cold and/or clammy skin, nausea or vomiting, and a dilation of the pupils. Evaluate the patient and begin CPR if deemed necessary. Contact Emergency Medical Services (EMS) and activate or call a 911 center immediately if the patient is unconscious or unresponsive. Be certain to elevate the body of the patient in a position with the feet 12 inches above the heart. It may be necessary to position patient on their side to prevent the danger of choking. Evaluate the patient for any additional injuries and report these to emergency personnel when they arrive at the scene. Symptoms found in patients who are experiencing seizures include unconsciousness or unresponsiveness, labored or difficulty breathing, uncontrolled bowel movements, the arching of the back, and clenching of the teeth or other objects. In the event of unconsciousness or unresponsiveness, contact Emergency Medical Services (EMS) or contact a 911 center immediately and begin administering CPR without delay, continuing until emergency assistance arrives. Check the patient utilizing universal precautions. Secure the patient, remove any potential life-threatening objects from immediate area and loosen the clothing of the patient. Never restrain the patient unless there is a danger to the patient or patient may hurt others. Contact the appropriate emergency personnel while administering CPR if deemed necessary. A stroke results from a blood vessel in the brain that has ruptured or been blocked. The human brain will suffer damage and deterioration when it stops receiving oxygenated blood. For rescuers or first providers, the severity of the stoke must be determined, therefore a stroke assessment system must be utilized. The Cincinnati Pre-Hospital Stroke Scale (CPSS Stroke Scale) is a simple tool designed to accurately assess the condition of those suffering from a stroke. If a patient ever falls into an unconscious state or becomes unresponsive, begin to administer CPR immediately and contact Emergency Medical Services (EMS) or contact a 911 center immediately and follow their instructions. A patient may experience facial droop if they have suffered from a stroke. Check the following for severity and report to emergency personnel upon their arrival. The body may be limited in the movement because of stroke, check the arm drift of the patient and report to emergency personnel when they arrive. The speech of those suffering from a stroke may be different than normal speech, evaluate by checking and report to emergency personnel when they arrive. When the examination of the patient is complete, if there is the occurrence of one of these three potential factors returning an abnormal result, there is statistically the probability of a 72% chance of stroke. Note: Some of the known risk factors of those who experience a stroke include the following: smoking, heart disease, diabetes, high blood pressure, or having previously having suffered a stroke. – Stroke – Risk Factors Note: First Aid Certification Class. Congratulations on finishing our First Aid Certification Class. Next, let’s test your knowledge.